Items 1/2. Welcome/Apologies (as above)/ Police report (Item 5). Chair Betty Wright welcomed everyone, then invited the police officer to give his report. This was very brief with the only calls received in the recent period were all weather related. Nothing else of note. Item 3. Minutes of last meeting. The minutes of the February meeting were approved as a true and accurate record, proposed: Rob Pope; seconded: Andy Wright. Item 4. Matters arising. (1) Ardgay/Bonar straight. Prices for seats have been circulated; quotes are awaited for the concrete bases. Nothing new regarding the proposal to amend the speed limit. LM Action. Chair will forward to LM the signatures collected by The Hub in favour of amending the limit. BW Action. (2) Plant tubs. An item is included in the newest edition of the Newsletter encouraging volunteers to take on the setting up and maintenance of the floral displays. A meeting will be held on March 27th at 5pm in Ardgay Hall for all those interested to find out more. If interested but unable to attend volunteers can email BW on betty.wright555@gmail.com or phone 01863 755316. (3) Defibrillators. Funding application to Beinn Tharsuinn submitted. If approved the project is ready to go ahead. The Culrain phone box has been cleaned but not yet repainted. (4). Mobile banks. Royal Bank of Scotland has responded saying there are no plans to include a scheduled stop in Ardgay. Item 5. Police report. After the departure of PC Morrison, the issue of ‘invisible’ pedestrians was raised. Incidents have occurred with drivers at night only becoming aware of pedestrians or animals at the last minute, owing to the lack of hi-vis clothing/attachments, especially concerning on the many poorly/unlit roads which are often also without pavements. Highlight this matter to the Police; perhaps also in the Newsletter. Police Action/SM Action. Item 6. Chairperson’s report. All relevant points covered during the meeting. Item 7. Secretary’s report. All relevant email correspondence has been circulated. (1) Information received via LM that it is hoped that electronic signs may be installed at Ardgay and Culrain stations. Awaiting follow up. LM Action. Item 8. Treasurer’s report. The 9th February 2018 balance at the bank shows no change from the report last month when the balance was £21,545.77 of which £20,667.04 are restricted funds. The Admin/General Fund has £ 878.73 available to carry out the business of the CC. The balances of the restricted funds are: Toilet Caretaking – £29.76, BTWF – Community Projects – £5,098.15, Newsletter – £3,013.00, BnO – £11,855.73, EON Path – £670.40. No statement was issued by the bank due to there being no transactions recorded. Item 9. Correspondence/Matters raised by local residents. (1) All received emails have been circulated. (2) Kincardine Hill road surface. A letter has been received on behalf of residents on Kincardine Hill regarding the resurfacing of the road in preparation for the timber extraction due at Garvary Forest. The new surface is very smooth and in icy conditions becomes dangerously slippy. During the recent bad weather there have been six accidents and three near-misses, many of which could have been far more serious if traffic had been present on the main road. Local residents have had to grit the road each morning as the gritter has not arrived before most people leave for work. As there are no pavements, the problem makes it impossible for pedestrians to walk on the road. Residents are calling for an urgent review of the surface and have contacted THC accordingly. CC will also write to Graham MacKenzie, Head of Roads Dept seeking urgent action. MT Action. (1) Planning. No issues raised. (2) Newsletter. The Spring Edition #39 is now in circulation. 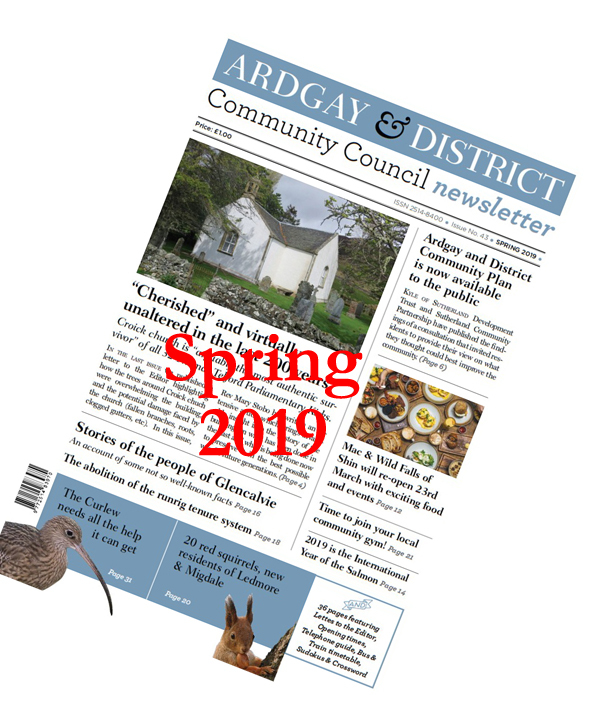 Thirty-two pages with the main article announcing the winners of the 2nd Ardgay & District Community Council Newsletter Children’s Art Competition. An exhibition and prize-giving event will be held in Ardgay Public Hall on Wednesday 28th March from 1pm – 3pm. Entry is free and all welcome. (3) Broadband. Nothing to report this month. (4) Windfarms. (1) Braemore. Reply from developers states they are not yet ready to discuss possible community benefit. (2) Coriolis proposals at Garvary now at scoping stage. (6) Kyle of Sutherland Development Trust. Nil of note. Item 11. Highland Council. (1) THC Budget Cuts. All CCs registered their feelings of being insulted and undervalued by THC. The sweeping cuts will make it impossible to meet the statutory duties. All members are volunteers with no-one claiming expenses, although they are allowed to do so. The new grant will not cover the CC to run the statutory number of meetings per year. If operating on a reduced number of meetings, many consultation deadlines will not be met nor will the views of the community have a vehicle through which to approach THC. LM explained the cuts to both CC grants and the Ward Discretionary Budget, reduced from £64,000 in 2007 to £15,000 in this budget. Possibly a new model needs to be found. There are eleven community councils in this Ward. If these can work together perhaps change can be brought about. LM is giving the situation urgent consideration and is willing to work with any/all CCs to find a way through these difficult times. Secretary will write to the Ward Manager seeking guidance as to how THC believes the CC can go forward in these circumstances. The removal of funding to run public toilets is also a major issue which LM will fight against. In an area where tourism provides such a high proportion of income it is inconceivable that facilities are to be removed. If any grant is forthcoming for the provision of the public toilets in Ardgay this season it will already be a month late by the time it is received resulting in the late opening of the facility. Item 12. AOCB. None raised. Item 13. Date and time of next meeting. The meeting will be held on Monday 14th May 2018 at 7pm in Ardgay Public Hall. BW/AW submitted apologies. SM to draw up agenda and chair the meeting.SM Action. Private Session. Beinn Tharsuinn/Beinn nan Oighrean Community Benefit awards. Application by Sutherland Agricultural Society was rejected. Application by Gearrchoille Community Wood Association received an award of £900 towards running costs. Application by A&DCC for £1,880 was approved towards the costs of installing two defibrillators locally in Ardgay and Culrain. Applicants and Alex Macmanus will be advised. MG Action. Items 1/2. Welcome/Apologies (as above) Chair Betty Wright welcomed everyone, then invited the police officers to give their report. This was very brief with only one advice call, one fixed penalty road traffic offence, one lost property and one external force entry. There were no matters raised by the CC. Item 3. Minutes of last meeting. The minutes of the December meeting were approved as a true and accurate record, proposed: Marion Turner; seconded: Betty Wright. Item 4. Matters arising. (1) Ardgay/Bonar straight/where to site seats. Two sites identified as satisfactory to provide seating at roughly the third-way points. If possible, seats could be set to face both ways to allow for best views. BW will price seats and concrete base installation and share quotes with CCs. She will also ask Creich CC if they wish to contribute to project costs.BW Action. (2) Defibrillators, Ardgay and Culrain. Discussion with BT now complete and community will go ahead with plans to site defibrillator in Culrain phone box. SM shared quotes with CC and will submit application to Beinn Tharsuinn for project match funding. SM Action. (3) Christmas lights newsletter article. AW will submit an article seeking local opinions and volunteers for next December. AW/MT/BW plan to erect the tree as last time. AW Action. A separate article may be submitted regarding the continuation of providing floral displays. (4) Polling station review. MT made online submission with views of CC. Item 5. Police report. See above (Item 1). Item 6. Chairperson’s report. (1) Plant tubs. BW will speak with Jean Richardson regarding possible arrangements for floral displays. BW Action. Item 7. Secretary’s report. All relevant email correspondence has been circulated. (1) Information received from Zurich Insurance regarding administration changes as the company takes over CC cover. It is understood that payment of the premium will continue to be deducted by THC before payment to CC. (2) It has been reported that street lighting in the parking area at the station are not working. CCs were reminded to advise locals of the facility on THC website to report such faults. A small item to this effect will be placed in the Newsletter. LM/SM Action. Item 8. Treasurer’s report. (MT) The 3 January 2018 balance at the bank was £21,545.77 of which £20,667.04 are restricted funds. The Admin/General Fund has £ 878.73 available to carry out the business of the CC. The balances of the restricted funds are: Toilet Caretaking – £29.76, BTWF – Community Projects – £5,098.15, Newsletter – £3,013.00, BnO – £11,855.73, EON Path – £670.40. Item 9. Correspondence/Matters raised by local residents. (1) Received emails have been circulated. A request to invite RBS and Bank of Scotland for the mobile bank to have a stop in the new square has been put to the banks. The response indicates that the schedules are full and no extra stops can be added at this time. Secretary will write formally to the banks asking that the schedules be reconsidered to allow this stop. MT Action. (2) THC’s draft Core Path review is now open for comments on updates made to the original plan. There have been additions to the path network around Ardgay, including new paths at Glencalvie. (2) Newsletter. (SM) Copy date for next issue is 21st February with distribution expected in the week beginning 12th March. Contributions are already being received and new advertisers are booking. The entries for the A&DCC 2nd Children’s Art Competition have been collected. Winners will be chosen very shortly. Awards will appear in the next edition along with the date of the exhibition. This year the intention is to organise the event on a week day to give the pupils the opportunity to attend as a school activity. (3) Ardgay Regeneration. A charging point for electric vehicles has been placed in the Square but is not yet operational. (4) Broadband. BT personnel have been in Culrain with residents being advised that rewiring is to be done to bring faster Broadband to the village. (5) Windfarms. (1) Braemore. Nothing heard from Braemore regarding community benefit. Chair will write again. BW Action. Croick. Nothing further. Sallachy. Conversations with Creich and Lairg CC are ongoing. (6) Kyle of Sutherland Development Trust. At the recent AGM, MT stood down from the Trust. Grateful thanks were given to her for her years of service since the early days of the Trust and her work in helping progress the various exciting projects which have already reached fruition. It was proposed that AW, who is already a Trust director, should take on the role of CC representative as well. With approval of all present, AW accepted. He then advised that the Trust website has not been kept up to date recently due to staff illness but that a new person is now in post so the site will be updated and maintained. This will help with keeping the public informed of Trust activities. Anyone with questions is encouraged to call into the new office in The Barn at any time. Item 11. Highland Council. (1) Temporary Ward Manager Garry Cameron is moving to a new position with Phil Tomalin returning to take up the manager’s post. Secretary will send message of thanks to GC for his help and support while covering this job. (2) Cllr McGillivray’s 6% Plan. In response to Cllr McGillivray’s email the CC will write suggesting several items which could qualify for Capital Budget spending. (3) Notice has been received of some of the proposals in THC Budget, to be approved on 15th February which includes the proposed reduction of CC annual grants by 50%. Secretary will write to the three local councillors clearly stating the financial position of the CC, explaining the Restricted Funds and making the case for the outgoing expenses which are incurred simply to keep the CC functioning. She will also mention the way in which the CC operates the Ardgay public toilets and state how well this system has worked. MT Action all points. Item 12. Any other competent business. (1) Sutherland Community Partnership. Three people are now based in the offices at The Barn working on locality plans. The CC was not made aware of this and will write to Peter Allan to ask what the remit for this is. MT Action. Item 13. Date and time of next meeting. The meeting will be held on Monday 12th March 2018 at 7pm in Ardgay Public Hall. Private Session. Beinn Tharsuinn/Beinn nan Oighrean Community Benefit awards. Application by Invergordon Academy for funding to help support a World Challenge Expedition to Nepal was rejected. Application by the Invershin Hall for a grant of £45 to run further Balance Bike sessions was approved with an award from BnO. Applicants will be advised. MG Action. Items 1/2. Welcome/Apologies (as above) Chair Betty Wright welcomed everyone and quickly passed the meeting over to Jason Gardiner who was introduced by SM. Item 3. Jason Gardiner to address the meeting. JG outlined his role as Station Manager for Sutherland covering Bonar Bridge, Lairg, Dornoch, Helmsdale and Durness. This area employs seventy-five retained firefighters across the area. A recruitment drive is currently ongoing in addition to many changes being looked at and implemented in how the Service operates and can best meet the needs of an ever-changing world. The model in place is still based on that instituted in the 1940s although the needs of the public and the demands on the Service have drastically changed in the intervening years. Details of how the transformation of the Service is being considered can be found on the Scottish Fire & Rescue Service website. A main change is due to the number fires being down 40% on twenty years ago due to safer household appliances, education, smoke detectors etc, with the incidence of road traffic collisions requiring Fire Service assistance also being greatly reduced due to changes in design and safety features in vehicles. The Service is now able to consider other ways of offering support to the community and other public service bodies. All retained fire fighters are highly trained not only in all aspects of firefighting but also in CPR, first aid, use of defibrillators, etc. Often a Fire Service vehicle can reach an emergency call faster than police and ambulance crews can, depending on area and staff available in all the services, and may therefore be able to provide an initial assessment and care. To do this type of work, new equipment is needed with smaller vehicles appropriate to the rural area. The role of the Service is changing and in rural areas in particular it must change to deal with the widely varying types of incident as opposed to those in cities and urban situations. It is hoped to improve staffing resources as the 24/7 needs in the rural areas require a different approach. Sutherland now has two full time paid officers in post and it is hoped to increase that number. JG stressed that he and the local stations are happy to provide full support to the community and the CC in any training events they wish to run, most especially defibrillator, CPR and first aid training. The recruitment challenges are immense with the understanding by the public of what is asked and can be given often misunderstood. For example, stay-at-home mums can slot into the six hours of daytime cover which is often difficult to find. The training does involve being away from home but thereafter being ‘on the spot’ can be an immense advantage to a local station. Flexibility is essential in rural areas but ideally firefighters should live within nine minutes of a station to meet response requirements. Anyone over the age of eighteen is eligible and there is no upper age limit. A reasonable level fitness is acceptable – fire fighters are not ‘super human’. A fear of heights can be an issue if it cannot be overcome. JG is hoping to achieve a level of investment in the local station at Bonar Bridge to provide better facilities, in particular the provision of separate male/female changing facilities. JG appreciates the difficulties faced by small local businesses in employing part-time retained fire fighters as it can be too onerous to allow for a member of a small team to be called away. With regard to the local training for using the defibrillators to be installed in Ardgay and Culrain, JG and SM will work together. Once all fire fighters are trained they will be in a position to spread that training further into the community. He stated the Service will be happy to support one or two CPR training events and to involve local schools and parents. With thanks from the CC, JG left the meeting at 7.40pm. Item 4. Minutes of last meeting. The minutes of the November meeting were approved as a true and accurate record, proposed: Andy Wright; seconded: Marion Turner. Item 5. Matters arising. (1) Defibrillators. See Item 3. SM will gather quotes for various models for discussion at February meeting. The funding is in place. It was noted that at the onset of recent Storm Caroline, the SSE Resilience listing came into operation with the CC being notified of help and support available. (2) Xmas tree and lights. MT, AW and BW succeeded in erecting the village Christmas tree complete with lights. THC Lighting Dept was most helpful in arranging the connection of the lights which will remain lit throughout the seasonal period. Thanks were expressed for this help and LM will pass on the CC’s appreciation. LM Action. It was agreed that further discussion should take place in the New Year with a view to attempting to establish a Christmas Lights Group to take on responsibility for all the seasonal lighting, assuming there is a demand from the community to have such lights in place. Agenda item. Feb/March. (3) Ardgay/Bonar straight. LM will push again for THC Roads Dept to take on board the serious concerns of the community regarding the speed restrictions on this road section. With The Hub in full swing and children often walking to and from the facility there is no doubt that this stretch should carry a 30mph limit with the rest of the straight having a 40mph. As long as it continues to be a 60mph, drivers will constantly be entering the area outside The Hub at speeds well in excess of 30mph, even if they are gradually slowing down from the derestricted stretch. The community at large is expressing concern over the safety issues around The Hub. The overall safety of pedestrians on the longer stretch is also of concern, as many people walk this, not least those from Bonar who are using the train station in Ardgay and have to walk to and from Bonar. This matter can be taken up with Scottish Government if agreement cannot be reached through THC. BW will forward to LM her letter to THC Road Safety Unit which to date has received no reply. BW Action. (4) Rail issues. Emails today between LM and Hitrans indicate an application has been made for new information signage on the FNL and for the infrastructure to automate stopping services and ‘request stops only’ to help improve service reliability. The project depends on securing match funding from Transport Scotland. Frank Roach is the local contact. LM will monitor this and the CC will write to MSP Gail Ross while also liaising with LM. LM/MT Action. (5) Polling station review. The deadline for this is 31st January 2018.Secretary will submit the CCs request on behalf of the community to keep the polling station within Ardgay Public Hall. MT Action. Item 6. Police report. PC Dave Thomson had arrived at 7.15pm during the discussion with Jason Gardiner. This month’s police report noted only five incidents: one community safety, one destruction of a fire arm, one assistance call, one child protection, and one noisy neighbour. The seasonal campaigns regarding drink/drugs driving are underway. DT left the meeting at 7.40pm. Item 7. Chairperson’s report. (1) Plant tubs. Various ideas put forward to allow for floral displays in the village in the coming year. For further discussion at February meeting. Agenda item. (2) It was agreed to make application to BTWF for £400 to assist with the Administration/secretarial costs incurred by the CC in administering community benefit funds. MT Action. Item 8. Secretary’s report. All relevant email correspondence has been circulated including the Weekly Planning Lists. Regarding the issue of adopting the Culrain phone box it is understood to be the wish of the community that this should go ahead with the box being used to house the new defibrillator. THC will install the power point. Secretary will advise THC Ward Manager. MT Action. Item 9. Treasurer’s report. (MT) The 30 November 2017 balance at the bank is £19,537.89 of which £18,784.31 are restricted funds. The Admin/General Fund has £ 753.58 available to carry out the business of the CC. The balances of the restricted funds are: Toilet Caretaking – £29.76, BTWF – Community Projects – £2,098.15, Newsletter – £3,783.80, BnO – £12,202.20, EON Path – £670.40. Item 11. Sutherland Community Partnership. LM outlined the Scottish Government’s directive for the running of Community Partnerships and the strategic levels of Services involved, i.e. Police Scotland, Scottish Fire & Rescue Service, Highland Council, NHS, HIE (and locally added 3rd Sector Volunteer Groups). At the next level are the Area Community Partnerships which include Highland Councillors. Communities are invited to engage via their elected representatives and via the Highland Council website where comments may be fed in ahead of meetings. Questions posed in this way should be addressed at the following meeting, although there is debate about how extra time can be allowed. The meetings are already lengthy. Although is not laid down as a procedure, Chair here does always allow questions from the floor. The process is still at an early stage and ways are being sought to improve the use of time and engagement with communities. (1) Planning. EE mast at The Craigs BT exchange. No objections. Secretary will submit a positive response. MT Action. (2) Newsletter. (SM) Issue 38 is expected to be ready for delivery on 12th December. The 32-page Winter 2017-18 edition features a wide range of articles. People have freely contacted the editor for the first time and some of these volunteers have offered to write or send photos to the newsletter regularly. A total of forty-two individuals have participated in the issue, from thirty-one different organisations which indicates the growing popularity of the newsletter with each edition. (3) Ardgay Regeneration. The Barn is open and occupied. CC recorded a hearty vote of thanks to the Trust for the transforming effect of the Square and the very positive effect on the centre of the village. (4) Broadband. Highland Wireless is continuing its work towards roll-out of services in the various local straths, hoping to begin signing customers in the first quarter of 2018. Public meetings will be held in Rosehall, Bonar Bridge and Ardgay as soon as it is possible. (5) Windfarms. (1) A meeting was held recently with representatives of all three local CCs to discuss the proposal to work together on community benefits from all future commercial windfarms within the boundaries of each CC, benefitting all concerned. If an agreement can be reached it is suggested that community benefit payments would be received by a fund management organisation, such as Foundation Scotland, to be managed at a local level by a panel of representatives from each of the three communities. The most obvious vehicle of this would be the ‘Achany’ panel which already operates in this manner on behalf of the three communities for two local developments. As it is always difficult to find panel members for such groups this would negate the need to set up a new panel and could draw on the existing expertise available. Fine tuning, such as number and length of panel meetings, etc would need to be done. BW will take comments back to the pilot group for discussion. An important advantage of such an arrangement would be that all the communities would speak with one voice in discussions with developers. BW Action. (6) Kyle of Sutherland Development Trust. See (3) above. All other projects progressing well. Item 13. Highland Council. (LM) (1) Councillors are awaiting the papers prior to discussions ahead of the budget in February. (2) THC has announced it is dropping the Dornoch Sports Barn project from the Capital Plan arousing strenuous disapproval from local councillors. This project has already been hit by delays and has taken ten years to reach this stage. Without the THC funding other funding will be lost and the project is in jeopardy. There is no similar facility anywhere near this and the loss of the project will be greatly felt throughout should it fail. (3) LM reminded CCs that THC will pay expenses for CCs attending THC meetings – car sharing is obviously required, payment is per car. Item 14. Any other competent business. (1) Asked about the recent meeting of the Culrain Hall Committee, RP advised that local opinion approved the demolishing of the old hall which is unfit for purpose and replacing it with a new smaller hall which could be extended at a later time if required. A committee with three trustees is in place. It has been established that the land was gifted to the community. A meeting to begin the process will be held in the New Year. (2) BW raised the issue of the number of THC services which now require online access, e.g. registering for THC pension for retired employees. In an area with almost non-existent Internet this is nigh on impossible for many and for a large number of elderly residents who do not use computers, the system is totally unworkable. BW will discuss further with LM. BW/LM Action. Item 15. Date and time of next meeting. The meeting will be held on Monday 12th February 2018 at 7pm in Ardgay Public Hall. Private Session. Beinn Tharsuinn/Beinn nan Oighrean Community Benefit awards. Application by the Ardgay & District Community Council Newsletter received an award of £200 from BnO towards the running of the 2nd Children’s Art Competition in 2018. Items 1/2. Welcome/Apologies (as above) Chair Betty Wright welcomed everyone, especially those attending with regard to the presentation from Muirden Energy. She invited the representatives to address the meeting. Item 3. Presentation by Muirden Energy. Angus Elder introduced himself and John Moisey on behalf of the company and indicated that they would be the contacts for anyone wishing to liaise with Muirden Energy regarding the proposed windfarm development at Meall Buidhe on the Croick Estate. He displayed a map which showed the boundary of the estate and the intended area for use during construction and siting of the windfarm. The company will work with the estate which is seeking to diversify and to sustain the estate. AE gave a brief history of the company (information is available on their website: www.meallbuidhewindfarm.co.uk ) The site was identified as having many positive attributes for wind energy such as high average wind speeds, landform screening, separation from residential properties, no onsite ecological designation, existing access from Strathoykel utilising forestry tracks whenever possible. Twenty-one turbines are proposed with a 3MW generating capacity. Tower heights between 69-78m, blade circumference 82m. The Wild Land restrictions on the south west of the site has required the siting of the development on the north east of the ridge line. The nearest designated Wild Land on the other side is to the north east beyond Rosehall. Although the overall area of the site is much larger than the area for the proposed siting of the turbines, this is to allow for establishing the most suitable access for the various stages of the development not for extending the windfarm at a later date. Access will be via Ardgay avoiding public road use as much as possible. Issues were raised from the public regarding the condition of a stretch of the public road and the unmade tracks proposed for use, which are already much damaged by the timber operations in the area. AE stressed that the company would be liable for all repair/reinstatement of roadways, legally bound to meet obligations and conditions laid down by THC. All roadways should be improved before access is required for the development and retained afterwards. The timeline indicated by AE showed the start of assessments for the EIA in September 2016, Scoping report to Scottish Government June 2017, public consultations in autumn 2017 and spring 2018 after which the findings of the EIA and feedback will be incorporated prior to submitting application to Scottish Government in autumn 2018. The first of the public consultations will take place in Ardgay on 22nd November between 1.30 and 6.30pm with another in Rosehall on the 23rd November 2.30 – 7.30pm. These sessions will be advertised locally. The EIA covers the various impacts such as visual, ecological, ornithological, noise, hydrology, peat and geology, archaeological and cultural heritage, transport and access, shadow flicker and aviation. A map showing various viewpoints was shown, 12 -14 viewpoints indicated; the company will add more viewpoints if asked. Photo montage should show realistic impressions and without screening by trees. It was pointed out that on the map there was no indication of the Achany and Rosehall windfarms nor the recently approved Braemore development. Also there was no mention of the proposals for Caplich and Braelangwell. AE stated the map and EIA will be updated to show these. JM advised that the machines to be used will be of the latest technological design and will be the quietest available although from the floor it was noted that the noise issues come from the wind passing over the top of the turbines and through the blades rather than the machinery inside the turbines. Latest blades are designed with serrated edges which effects a major noise reduction. This would pose an added danger to bird life in the opinion of some present. The siting of this development between two very important designated areas of special scientific interest was questioned with AE stating that all possible precautions will be taken. Asked about the connection to the grid AE said the company is in discussion with SSE on all aspects for this but was unable to elaborate at this stage. When pressed he stated that Invershin Power Station would be the connection point with cabling to it underground whenever possible. The cables would presumably have to cross the river prior to reaching the substation. The high levels of fuel poverty in the area were mentioned and in response AE indicated that Muirden Energy is keen to utilise the latest technology, looking at energy storage and ways for distribution options to benefit local fuel prices. Transportation of turbines and blades on the narrow single-track roads and tracks and over the various bridges is a major concern to the public. JM stated the company will be bound by THC decisions on which roads can/cannot be used. Asked if local materials will be used to create the concrete bases on site, AE said that surveys to establish local borrow pits are being done along with peat surveys. Shared ownership schemes will be offered to both individuals and local trusts wishing to invest in the windfarm. Details can be had from the company and will be available at the public consultation sessions. After a short break for the Police Report (see Item 6), the impacts on tourism and businesses operating in this sphere were raised. The company was urged to use up to date surveys as older ones, such as the Moffat survey in the 1990s, are no longer relevant. AE said that several surveys would be studied, some currently being produced. Other concerns raised by the public included the disproportionate number of windfarms surrounding the local area which will have a major knock-on effect on tourism businesses, the ‘ring; of turbines interrupting many flight paths of the indigenous wild bird populations, effects on the many water courses through the developed areas, and the actual working time of the turbines, as witnessed by the many occasions when the existing turbines are not turning. AE stated that individual agreements with the National Grid are now very different from when those windfarms were established which should lead to maximum usage of the turbines on Meall Buidhe. The case for the positive impacts locally of the windfarms was made with AW reminded the meeting of the many local projects currently running thanks to community benefit, the jobs created, issues already addressed and pressed the company to take all such possibilities into account when dealing with the local communities. Chair expressed thanks to AE and JM for their presentation and willingness to engage in open discussion with the community. In reply AE encouraged feedback to the company directly, through the CC or by attending the upcoming public consultation sessions. This item concluded at 8.15pm. Item 4. Minutes of last meeting. Following a short break the meeting reconvened at 8.25pm. The minutes of the September meeting were approved as a true and accurate record, proposed: Silvia Muras; seconded: Marion Turner. Item 5. Matters arising. (1) Seats on Ardgay/Bonar straight. Cllr Munro has raised the formal request to change the speed limit. Two letters to THC from CC have as yet gone unanswered. Further letter will be sent to Graham MacKenzie, Head of Roads Dept. MT Action. It is understood that staff at The Hub have started a petition and the CC will gather examples of other villages with long speed restricted stretches on their outskirts. Older residents remember seats in place along the straight. RP reported the lights in the 30mph signs at the approach to Ardgay from Bonar and approaching Bonar from Lairg are not working. MT Action. (2) Poling station review. THC will accept comments until the end of January 2018. Discuss at next meeting. Agenda item/BW Action. (3) CC Insurance via THC. Colin MacKenzie THC has advised there will be little change. THC will still deduct the premium before paying the annual grant, but the documents will be sent direct to the CC. (4) Culrain station. LM to be asked if City Region Deal can be accessed to provide the essential electronic signage at Culrain and Ardgay stations. BW/LM Action. Another letter will be sent to Scottish Government Transport Directive and Customer Relations at Scot Rail. MT Action. (5) Defibrillators. Grant application was successful. SM will invite Rick Laird, Scottish Ambulance and Jason Gardner, Fire Service to December meeting. Agenda item. SM/BW Action. (6 /7) Barbed wire at path at Culrain/Kincardine Hill road. No update on either item. Item 6. Police report. PC Dave Thomson had arrived at 7.50. His report noted thirty-two incidents, 75% of the thirteen traffic issues were of speeding, five alarm calls, eight assistance calls, three animal related, one suspicious person, one weather related. BW stated that there had been an attempted break-in at the Gearrchoille Community Wood storage container. BW noted that she had reported this last item but was dissatisfied with the response from the 101 call centre in Inverness. DT advised all callers to 101 to get a reference number for the call as this will ensure call is logged and follow up occurs. DT left at 7.55pm. Item 7. Chairperson’s report. (1) Leslie Pope has recently stood down as Secretary and was warmly thanked for work over the last year and a half. MT will carry on with Secretarial work meantime and was also thanked for adding this to her workload as Treasurer. (2) An increase in the remuneration for the Minutes Secretary was approved in line with the rate paid by both Creich and Lairg CCs. Proposed: BW; seconded MT. MG was thanked for her continued work with the CC. Consideration will be given to applying to Beinn Tharsuinn Fund for a contribution to the CC’s administration costs. (3) Plant tubs. Jean Richardson, Cherry Alexander. Jenny Betts and the Growing Group have provided excellent floral displays without incurring large costs. There may be money left in the Regeneration Project which could be accessed to update all the tubs and displays in the newly created Drovers Square. Discuss in the spring. Agenda item for March/April. Coastal defence works. No implications for the community. Reply with no comment. MT Action. Item 8. Secretary’s report. All relevant email correspondence has been circulated including the Weekly Planning Lists. No action required. Item 9. Treasurer’s report. (MT) The 27 October 2017 balance at the bank is £20,079.89 of which £19,326.31 are restricted funds. The Admin/General Fund has £ 753.58 available to carry out the business of the CC. The balances of the restricted funds are: Toilet Caretaking – £329.76, BTWF – Community Projects – £2,145.15, Newsletter – £3,2728.80, BNO – £12,452.20, EON Path – £670.40. The toilets will be closed at the end of the month with the water turned off. THC funding of the facility is to be reviewed next year. Item 10. Matters raised by local residents. SM had circulated comments received via Facebook. MSP advised CC that the Scottish Education Bill is open for comments till January 2018. Secretary will continue to circulate press releases from Scottish Government. Item 11. Christmas tree and lights. AW advised that all the lights are working bar two. Meeting to be held on 14th November with The Hub, KoSDT and GCWA. ‘Santa’s Magical Woodland’ is proposed again following the success last year. Once again AW will acquire a tree for the centre of the village, but this should fall to someone else next year. Discussion with Robbie Gunn, THC Lighting, could result in Christmas lights remaining on 24/7 during the season. Item 12. Sutherland Community Partnership. MT attended the last session. As this is a ‘meeting held in public’ and not a ‘public meeting there is little opportunity for public comment or involvement. Christine Ross, VG-ES, is the only Sutherland resident on the panel. Most of those attending are doing so in work time and therefore paid to be there whereas all others must do so at their own expense. This does little to actually involve communities. Discuss with LM at next meeting. LM Action. (1) Planning. Nothing relevant this month. (2) Newsletter. (SM) Thursday 23rd November is copy date for all contributions, adverts and letters to the Editor. The aim is to distribute the hard copies during week commencing 11th December. (3) Ardgay Regeneration. Project proceeding very well. An Open Day is arranged for 27/28th November. (4) Broadband. Nil of note. (5) Windfarms. (1) Braemore windfarm has received Scottish Government consent. Were Community Benefit discussions were held when the development was first proposed? MT/BW to contact Creich and Lairg CC to ascertain current position. BW will circulate to CCs relevant documents. BW Action. (2) Sallachy. MT/BW attended discussions regarding community ownership. Developers are keen to progress this as it may help with Planning Applications. Also for possible discussion with Lairg and Creich CCs. BW Action. (6) Kyle of Sutherland Development Trust. Nothing relevant. Item 14. Highland Council. Nothing in LM’s absence. Item 15. Any other competent business. (1) None raised. Item 16. Date and time of next meeting. The meeting will be held on Monday 11th December at 7pm in Ardgay Public Hall. Application by the Ardgay Public Hall received an award of £1,750 from BTWF and also £250 from BnO towards the refurbishment and decorating of the gents’ toilet. Invershin Hall Committee received £146.47 from BnO towards balance bike sessions. Items 1/2. Welcome/Apologies (as above) Chair Betty Wright welcomed everyone and asked the Police representative to give the report. Twenty-eight incidents have been recorded in the last month, of these twelve were road traffic related – one road traffic accident, one no insurance, one overweight vehicle, four of driver behaviour and three road traffic hazards (breakdown, diesel, etc). The other incidents comprised ten advice calls, one medical matter, two relating to animals, one wildlife crime, one disorder and one false call. Advice was given for the public to be aware of a spate of rural thefts, many in the Dornoch area, of tractor batteries, fuel, etc. The public should be particularly vigilant and report any unusual behaviour particularly in the rural areas. Item 4. Chair then invited Helen Houston to bring the CC up to date with the business of the Kyle of Sutherland Development Trust. Much detail was given regarding the excellent progress of the Ardgay Regeneration Scheme with the project being on schedule and on budget. The Trust hopes to move into its new offices around the 3rd December. Two open days are planned for 27th/28th November when members of the public will be welcomed to visit the new units in the refurbished barn, the outside walls of which have been sandblasted and restored. Albyn Housing has planning permission for four, two-bedroom houses on the west side of the square and there will be one private house plot for sale which will be handled by Highland Small Communities Housing Trust. The four houses are expected to be ready for occupancy late next summer. The square is made and the road has been adopted by THC. Interpretation panels should be ready by November. The planned art gallery will not now be set up and the space for it has been rented. This exciting project will bring new life to the centre of Ardgay. CC members expressed great delight in the project, welcoming the use of the ground space and in particular the preservation of the barn building once part of the original farm buildings on this site, ensuring its ongoing use. The Falls of Shin Visitor Attraction has been constantly busy since its opening with upwards of 70,000 visitors passing through the café and shop. Staff are settling into their new roles, many of those employed are local people. The path to the falls was damaged during a recent storm and will be re-surveyed with repairs carried out in due course. The first wedding to be held there went very well and the centre will be marketed now as a wedding venue for next year. A Falls of Shin Experience Officer is in post to promote all aspects of use of the facility, including business networking events. A recent working breakfast event brought people from Inverness and Thurso as well as closer to home. Overnight parking/camping has been a slight problem and this will be discouraged, especially as some of those parking do not make use of the facilities in the centre. Some issues have arisen within the wooded areas due to their being used as toilets by these visitors. The other projects within the Trust are ongoing: Keep Active Together has been refunded with many activities once again up and running, Food shop and café has around forty-five regular attendees with between forty and sixty people there most weeks. The evening café has attracted between twenty to twenty-five and the entertainment has been provided by local volunteer groups. This project is funded by Scottish Government to support those in need of help with food supplies and to encourage social contact. At the start of the summer special attention was given to families who would miss the school meals service through the holidays. The Energy Advice Service remains very busy and is achieving beyond the targets set by Scottish Government. Refunding for the next two years is being sought in hopes to extend the service throughout Sutherland. Events, shows, school and elderly centre visits continue. A major ‘Step Up, Step Down’ housing facility is in the early stages of talks and design. To be situated opposite Migdale Hospital the accommodation could comprise ten units with high-spec technology to offer help to those ready for hospital discharge but not yet able to go to their own homes without support. A respite bed and family accommodation is envisaged allowing relatives to stay near at hand in cases of severe illness/end of life situations. This is a very innovative project with much more work to be done to bring it to fruition. As Sutherland is one of the areas with a very high number of aging population new thinking of how services can be provided is essential. A Contracts Team is being established and the Trust is beginning to sell its expertise in management services throughout Highland. This is turn will bring in extra revenue to allow the Trust to work on yet more local projects in the future. Helen was also excited to advise that the Trust has recently taken delivery of its own vehicle, an electric powered Renault Zoe. This will be used by Trust officials when traveling locally on business. A charging point is in place at Falls of Shin and another will be sited at The Barn in Ardgay. The door of the Trust office is always open to anyone wishing to discuss ideas or projects, anyone seeking advice or help regarding funding or any of the other avenues in which the Trust team now has experience, or even people just wondering what is going on with the Trust at any time. Helen was very warmly thanked for taking the time to bring the CC up to date with so many of the aspects of life at the Trust. Item 3. Minutes of last meeting. The minutes of the August meeting were approved as a true and accurate record, proposed: Andy Wright; seconded: Silvia Muras. Item 5. Matters arising. (1) Seats on Ardgay/Bonar straight. BW in touch with THC Ward Manager and Access Officer Matt Dent who has been encouraging. LM advised that Cllr Currie is looking at a similar project elsewhere in the Ward as part of a Scottish Government funded ‘Active Communities’ initiative and suggested that the CC discuss this with her. MT Action. At a recent CC surgery LP received complaints regarding speeding on this straight and concerns due to the increase in traffic of all kinds now that the Hub is open. Speed indicator devices could also be installed. CCs to forward all their ideas to Chair who then will liaise with the Hub and contact THC Roads Director, Graham MacKenzie. BW Action. (2) Kincardine Hill Road. Road survey has been completed with road improvements expected soon before timber extraction starts. Meeting of Graham MacKenzie and residents on 20th August was productive. (3) Highland.gov email address. Advised that this is not possible due to costs. Agreed to maintain the present contact arrangements. (4) Barbed wire Culrain path. Issue reported via Matt Dent in August. Monitor. (5) Carbisdale trails. Forestry Commission Scotland (FCS) has confirmed the trails are closed due to financial restraints. Existing local access group (Kyle f Sutherland Forest Trust) is interested in taking on upkeep. MG to provide RADAG Chair email to LP for more information as to Rosehall’s progress with the trails there. MG Action. An open meeting was held in Culrain recently to discuss the future of the hall. Locals wish to maintain some form of meeting place and an outside-accessible toilet/shower facility is required. This could prove to be a money-maker for the village. (6) Culrain station. Nothing further this month. The installation of an electronic advice board at both Culrain and Ardgay stations is essential. (7) CC insurance via THC. CC opinion is that the status quo should be maintained rather than every CC having to seek out individual insurance. Secretary to ask THC why this change has to happen. LP Action. (8) Polling station review. Statistics on footfall at the election are inconclusive. Official consultation due in October.CC View remains that the polling station should be located in Ardgay Public Hall. (9) Toilets supplies. Late again this month but stock now received. (10) Christmas lights. Agenda item in November. Item 6. Police report. See item 1. Item 7. Chairperson’s report. (1) CCs asked to ensure that Chair is notified of all items in good time ahead of meetings. (2) Once Regeneration works are complete and the noticeboards are in full use again, space should be reserved for CC information, or the CC should erect a dedicated board of its own. (3) Hall Auction raised £2,255. The CC was thanked for its support. (4) THC Quality Awards nominations. SM will nominate Matt Dent and BW will nominate John Clark. SM/BW Action. Other correspondence included a survey of a Charter of Patients’ rights, information regarding fireworks licence, changes to provision of dog waste bins, Low Emission Zones consultation, Highland Senior Citizen Network mailing list inclusion, FCS grant scheme, THC Welfare Support Team Debit Advice, Intimation of Sutherland County Committee meeting in November, Forest Enterprise Scotland Land Management consultation and Fountain Forestry Soil Association management assessment. 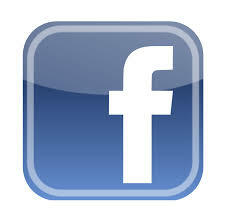 Details of relevant items will be put on the CC Facebook page. SM Action. Item 7. Secretary’s report. All relevant email correspondence has been circulated. NHS poster passed to SM. Countryside Alliance Awards, ‘Rural Oscars’ – nomination information will be put on Facebook page. SM Action. Item 9. Treasurer’s report. (MT) The 9 August 2017 balance at the bank is £21,701.95 of which £20,765.12 are restricted funds. The Admin/General Fund has £ 936.83 available to carry out the business of the CC. The Annual Community Benefit Payment from Beinn Nan Oighrean was received on 8 August 2017. The balances of the restricted funds are: Toilet Caretaking – £729.76, BTWF – Community Projects – £2,145.15, Newsletter – £4,517.61, BNO – £12,702.20, EON Path – £670.40. (2) Newsletter. (SM) Delivery of the autumn edition of the ADCC newsletter is expected on 13th September. Due to the amount and quality of contributions this issue will, for the first time, comprise thirty-six pages. A total of twenty-four different local groups have been in contact for this edition, submitting contributions, book adverts or to update details. SM was congratulated by all present for another excellent edition and her ongoing work. Deadline for the winter edition is the third week in November. (3) Ardgay Regeneration. See item 4. (4) Broadband. It is understood that HIE is conducting a review of CBS. (5) Windfarms. (1) Coire na Cloiche. Confusion last month regarding a document received has been clarified. The CC is not now required to sign it. (2) Meall Buidhe. Angus Elder of Muirden Energy will attend the November meeting. (6) Kyle of Sutherland Development Trust. See Item 4. Item 11. Highland Council. LM hopes to have an update from BT after the next meeting of the County Committee. Education – THC progressing to more campuses of larger schools. Government requirements for 1000 hours of nursery provision by 2020 could lead to many difficulties. Item 12. Any other competent business. (1) SM thanked Cameron Warren for his interest in the CC which hopes to encourage younger members of the community to attend/join. Item 13. Date and time of next meeting. The meeting will be held on Monday 13th November at 7pm in Ardgay Public Hall. Application by the Kyle of Sutherland Hub received an award of £250 from the BnO Small Grants Fund to help with Fitness Instructor Training.